March 25, average low 38°, average high 64° Historic low 17° (1960) high 81° (1986)’ average rainfall for the day is 0.16". Cave temperature is always 58°, no chance of rain, mostly dark. Moderate activity levels may be encountered. The surface trip has two options one is more strenuous section with a 200 ft elevation change the other 50 ft elevation change. In the underground section of the Cave tour there are 86 steps to go down and 86 to climb back up. Breakfast is on your own, a family style lunch at Esters Farm Café and Catering (included in the trip registration fee). Bottled water will be provided during the day. Thomas Brackman, Director, Geophysics Innovations Laboratory at Western Kentucky University, Vice President/Principal Geophysicist NSG Innovations LLC. Professional Geologist specializing in geophysics with applications to real world problems. His current research is using near surface geophysics for delineation of historic landfills. 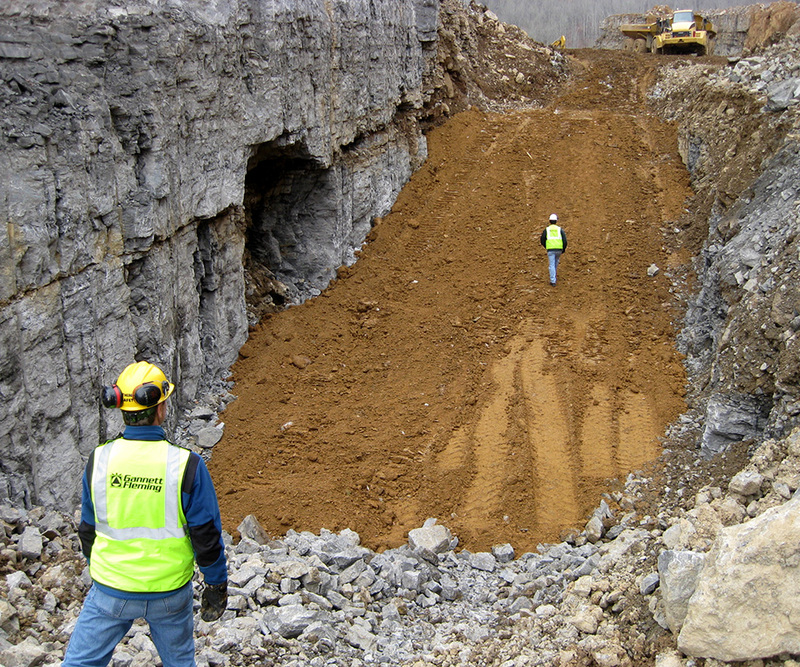 Specialties include cave and karst, environmental, mining and geotechnical arenas. Former Director of the Laboratory for Applied Geophysics at Northern Kentucky University. His current research effort includes undergraduate and graduate student-assisted outcrop and subsurface investigation of Mississippian and Pennsylvanian rocks in south central and western Kentucky associated with the Mississippian-Pennsylvanian Unconformity. The goal of the current research is to incorporate geophysical well log, petrography and outcrop data to map out the unconformity and ultimately define in detail the tectonostratigraphic framework for basal Pennsylvanian channel sequences. 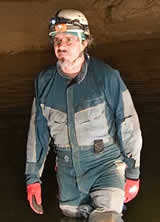 Dr. Rickard Toomey, Cave Specialist and Research Coordinator, Mammoth Cave National Park, Rick is the Cave Resource Management Specialist at Mammoth Cave National Park and was the Research Director of the Mammoth Cave International Center for Science and Learning. 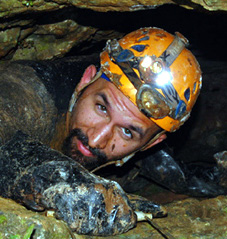 He also works with resource questions involving caves, karst systems, and bats at the park. He functions as a geologist, hydrologist, or biologist as the need arises. Dr. Jason Polk, Associate Professor of Environmental Geoscience, Director CHNGES, Western Kentucky University. 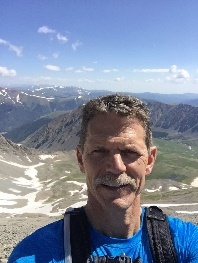 Dr. Polk is an Associate Professor of Geoscience and Director of the Center for Human GeoEnvironmental Studies (CHNGES) and the HydroAnalytical Lab. 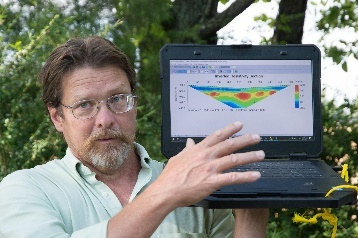 Dr. Polk's current research investigates climate change, water resources and sustainability, isotope hydrology and geochemistry, karst resource management, and global climate dynamics. A generous donation by the Geophysics Innovations Laboratory at Western Kentucky University has enabled SAGEEP to offer this trip at rates allowing the greatest participation. Field Guides will be available for participants. The 31st Symposium on the Application of Geophysics to Engineering and Environmental Problems (SAGEEP) slated for March 25-29, 2018, will host a field trip to see some of the world’s best examples of karst terrain located north of Nashville in south central Kentucky. Geophysicist and non-scientists alike will enjoy an early spring trip through karst country as we travel to Mammoth Cave National Park, enjoy local cuisine at Esters Farm Café, take in the sites and enjoy refreshments at Park Mammoth Resort and see the results of ignoring karst dangers at the Corvette Museum. The trip is a must see for any lifetime learner. Whether you are a geophysicist nerd, curious caver or happen to be the significant other (or not) of the two latter categories you will want to enjoy the field trip north. Spring will be starting to bust out the green color palette at the end of March and the redbud trees with their purple flowers will be in full force along with the daffodils or jonquils. A trip to Mammoth Cave, a world heritage site and international biosphere preserve along with the taste, overlooks and pleasantries of the region will tickle everyone’s fancy. Bring your selfie stick and camera for fantastic photo opportunities. Our 1.5-hour trip north starts from the Convention Hotel where our guides Thomas Brackman and Michael May will start with a description of the local geology as we make our way out of Music City. We will wind our way around Nashville and travel out of the older Ordovician rocks of the Nashville Dome onto the Mississippian age Highland Rim and beyond. 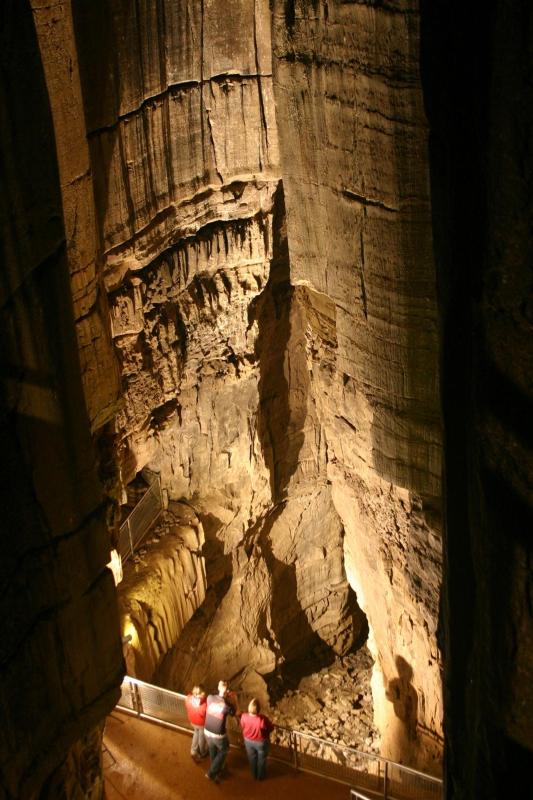 Our first stop will be Mammoth Cave National Park. Here we will start with an hour-long surface trip to see some geophysics studies conducted by students. We will be joined by the spirit of Bruno Petsch, who in September of 1936 conducted Earth-Resistivity measurements as part of the Civilian Conservation Corps. Thomas Brackman will discuss multiple geophysical methods conducted in the Park in more recent times including electrical resistivity, Refraction Microtremor, GPR and gravity. We then head underground through the Historic Entrance. The Park is home to the longest mapped cave system in the world (412 miles in length and counting) with abundant speleothems, mammoth domes and great halls. Our guide, Dr. Rick Toomey, will take us into the cave along the historic trail for approximately a 1 hour trip. Lunch is scheduled around noon at Esters Farm Café and Catering in Bon Ayr, Kentucky. Gabe (the owner and former Park Guide) offer simple, delicious, homemade comfort food using fresh, local ingredients when possible from fellow farmers within the community or even straight from his own farm. He believes it's just better that way. After lunch, we will briefly stop at Park Mammoth Resort, Cave Valley Winery for a view of the karst plain and the spring colors before we drive south to the Corvette Museum in Bowling Green, Kentucky. 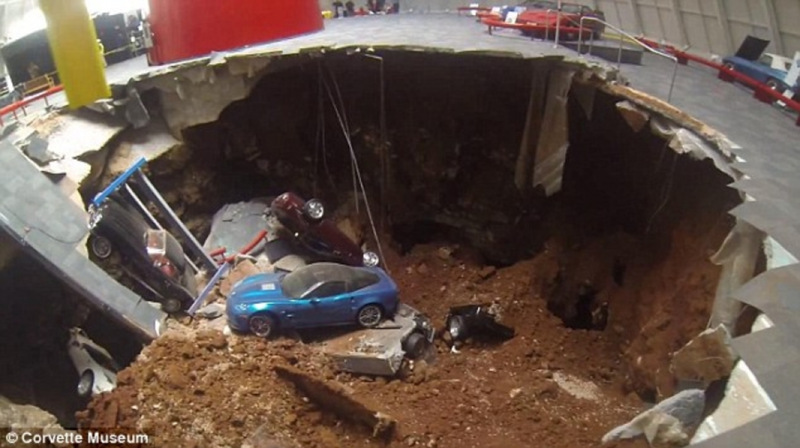 Dr. Jason Polk will guide us through the catastrophic collapse of the museum’s central display that destroyed several millions of dollars worth of one-of-a-kind Corvettes. Jason was the first geoscientist on site and was part of a team conducting gravity surveys to rapidly assess the situation. Fortunately, the collapse occurred during the very early morning hours and no one was in the building at the time. Of course, there is no need to worry, the building has been repaired and a permanent collapse display has been created to spread the word of the dangers of karst. We will spend about an hour and a half here, so you will have opportunities to tour the museums and purchase souvenirs. From here we will bee line to the convention hotel in time to allow you a moment to freshen up for the Ice Breaker so you can regale others of your incredible journey into the land of karst. at around 5:44 AM local time, causing a portion of the floor to collapse. This field trip will highlight two federally owned dams which are both located in karst-prone areas in Middle Tennessee. Center Hill Dam is owned by the U.S. Army Corps of Engineers (USACE) and Normandy Dam is owned by the Tennessee Valley Authority (TVA). The field trip will end with a stop at the George A. Dickel Distillery visitor’s center. 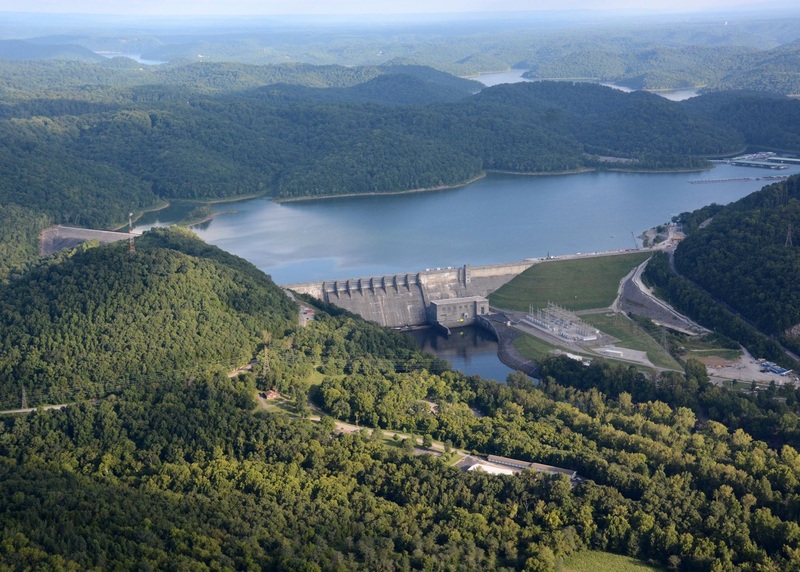 Center Hill Dam is sited at Mile 26.6 on the Caney Fork River, a major tributary to the Cumberland River. The Center Hill project was put into service in 1951 to provide important regional benefits of flood control, hydro power, recreation, water supply and water quality. The main dam consists of a 1382ft (421m) long concrete section and a 778ft (237m) long rolled earth embankment. A 770ft (235m) long saddle dam lies within a narrow valley along the right rim, about 1500ft (457m) upstream of the main dam. A three-generator-unit power plant, with a capacity of 135,000kW, and switchyard are located immediately downstream. The site geology is characterized by numerous caves, springs, and sinks. These features are typical of the soluble limestone of the region and indicative of a well-developed karst terrain. Center Hill Dam is founded in nearly flat lying limestone and shale of Ordovician age. In ascending order, the formations present at the dam site are the Carters, Hermitage, Cannon, Catheys, and Leipers of Ordovician age, the Chattanooga of Devonian and Mississippian, and the Fort Payne of Mississippian age. The contact between the Hermitage and Cannon formation is an unconformity with a significant amount of karst development. The Catheys formation forms the upper portion of the foundation of the concrete dam and earth embankment. The Catheys is a finely crystalline to crystalline, hard, fossiliferous limestone. The contact between the Cannon and the Catheys is also an unconformity with localized karst development. Limestone karst seepage has been an issue with operation of the USACE’s Center Hill Dam since construction of the project in the 1940s. Project designers acknowledged the cave-scattered region would require future grouting to control seepage through the well-developed bedrock joint system. Despite several localized grouting efforts over the years, total seepage increased to unprecedented levels under normal reservoir conditions. 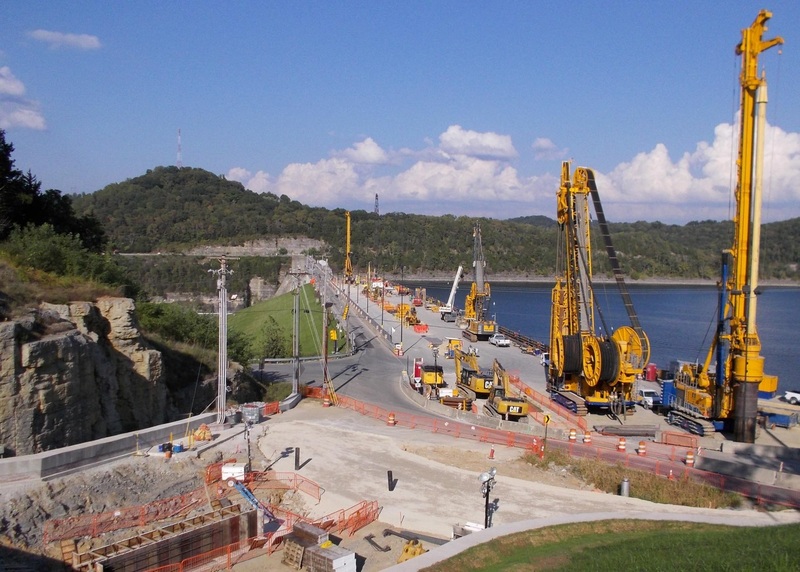 Foundation conditions deteriorated in the clay-filled rock joints within the rims, the abutments and the dam’s foundation to the point that USACE initiated a major rehabilitation project to address these concerns. Seepage also posed risks to the continued safe operation of the saddle dam and associated fuse plug at the project. Along with an extensive drilling program, surface and borehole geophysics were conducted at the saddle dam to identify potential seepage paths within the underlying karst geology and to assist in the design of an RCC stability berm for the saddle dam. The electrical resistivity imaging and spontaneous potential methods employed at the surface characterized the lateral changes in subsurface materials while optical televiewer, acoustic televiewer and natural gamma borehole surveys imaged and measured the physical properties of material surrounding the boreholes. 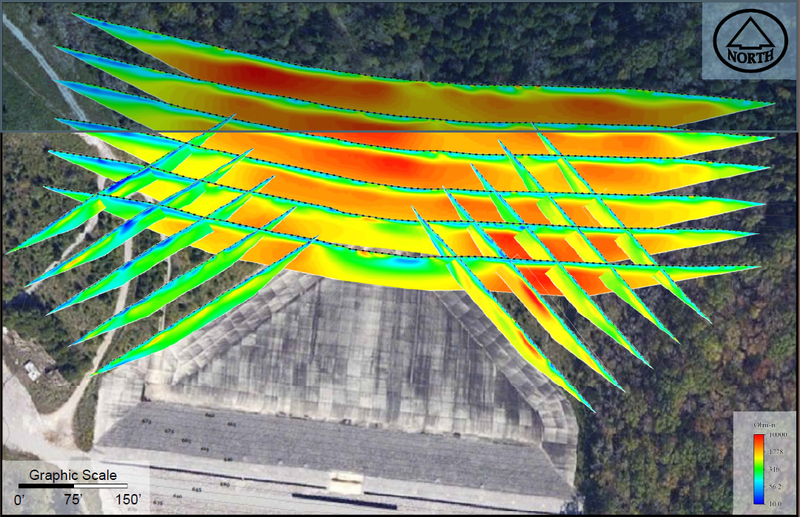 A ground penetrating radar survey along the face of the saddle dam identified the presence of potential voids directly beneath the concrete face. 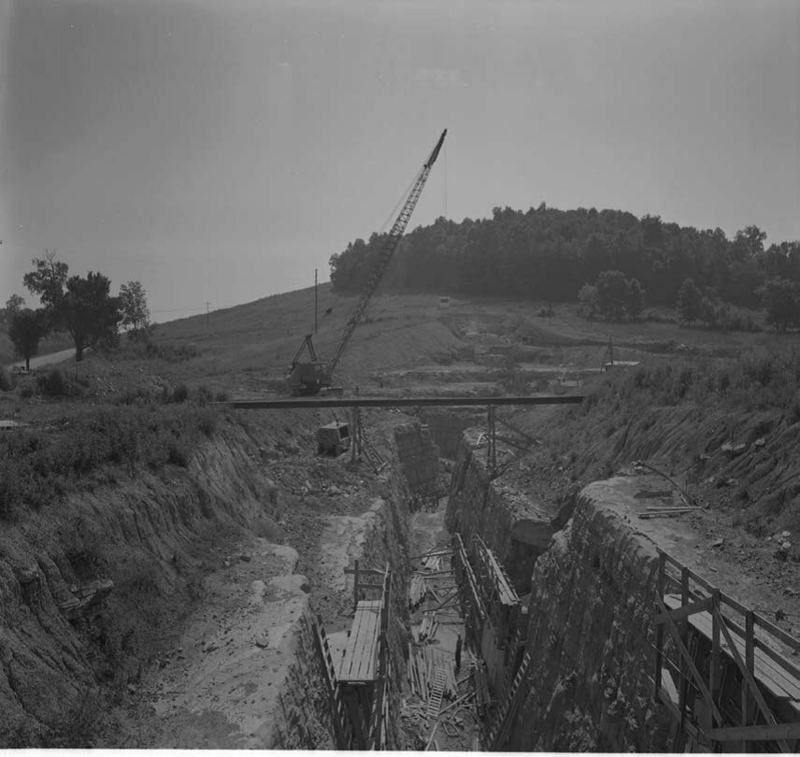 The Tennessee Valley Authority’s Normandy Dam is a water supply and flood control dam founded on limestone bedrock consisting of an earth fill embankment and a concrete gravity dam with a gated spillway. 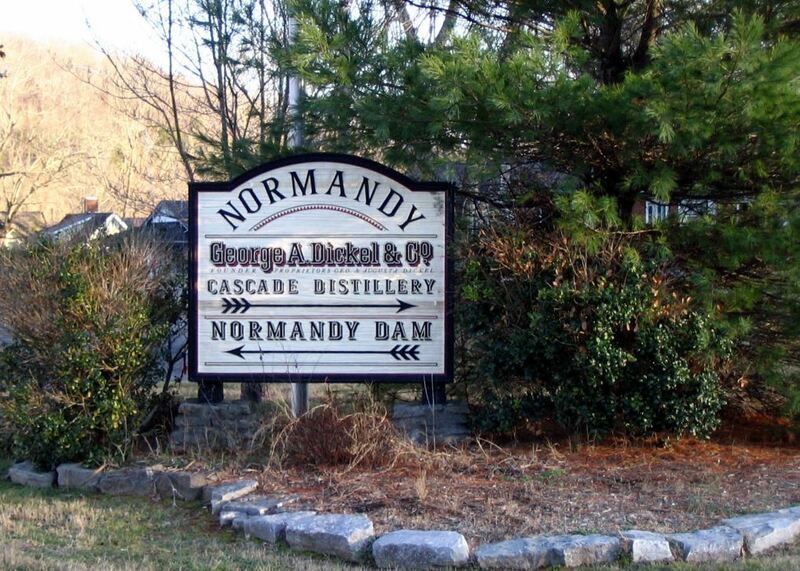 Construction of Normandy Dam began in 1972 and was completed in 1976. The dam impounds Normandy Reservoir and is located on the Duck River at mile 248.6 in Coffee and Bedford Counties, Tennessee, approximately 8 miles north of Tullahoma, Tennessee, and 1.5 miles upstream of Normandy, Tennessee. The Normandy Dam includes the following associated features (listed from west to east): west (right) abutment, concrete gravity non-overflow section, 2-bay gated spillway and concrete apron, concrete gravity non-overflow section, earth embankment section, and east (left) abutment. 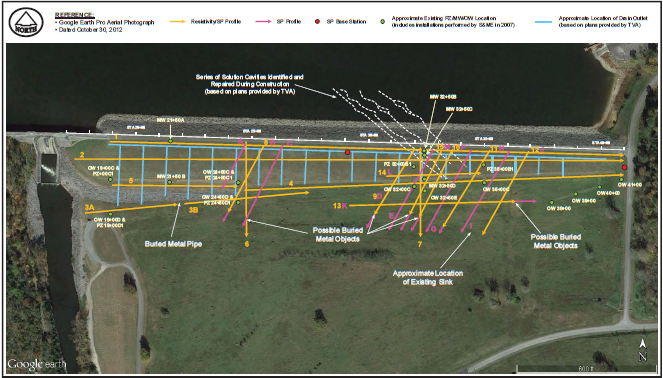 The embankment section at Normandy Dam is a homogeneous rolled earth embankment approximately 2,700 feet long. The crest of the embankment is approximately 20 feet wide at EL. 895, yielding a maximum height of about 85 feet. The concrete gravity portion of the dam is composed of 13 monolith blocks and is approximately 506 feet long with an approximate maximum height of 114 feet. The top of nonoverflow section is EL. 895. The ogee spillway consists of two 36-foot wide bays each with a structural steel tainter gate. Geologic conditions at Normandy are very similar to Center Hill Dam and include some of the same bedrock geologic formations. However, the intensity of karst formation appears to be somewhat less at Normandy Dam compared to Center Hill Dam. The bedrock geology immediately below the dam consists of the Catheys Formation, which is a thinly-bedded limestone interspersed with bands of blue-gray shale, or the Cannon Limestone, a uniformly-bedded limestone containing thin undulating shale lenses. 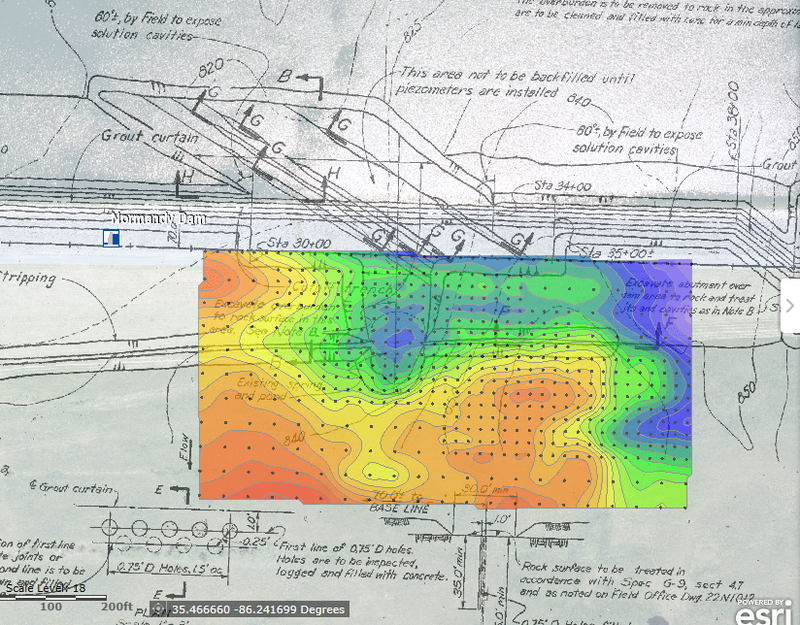 Joint controlled solution features are common at the project especially in the Cannon Limestone as documented through foundation geologic mapping and construction photographs. A site investigation was performed by TVA in 2015 as part of TVA’s Dam Safety Assurance Program. 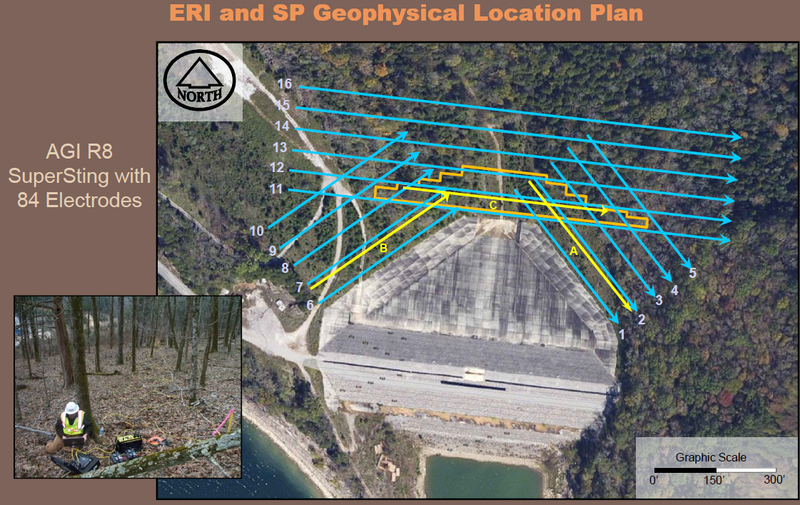 This investigation included geophysical surveys to help determine whether any seepage had developed along the major karst dissolution features since dam construction. The geophysical surveys conducted were microgravity, electrical resistivity tomography and spontaneous potential. While some minor anomalies were indicated on the ERT and SP data, these surveys did not identify any significant anomalies that could be definitively tied to pre-existing karst features. However, the microgravity survey produced results that were in excellent agreement with known karst features that were identified prior to construction. Jeff Munsey has worked for the Tennessee Valley Authority for over 30 years. Most of that time has been devoted to ensuring the safety of TVA’s dams through seismological, geophysical and geological investigations and evaluations. Mr. Munsey earned his B.S. and M.S. degrees in Geophysics from Virginia Polytechnic Institute & State University. Currently, he is the manager of TVA’s Dam Safety Risk and Emergency Preparedness group. He still finds some time to dabble in the geophysical and geological aspects of Dam Safety work and designed and oversaw the geophysical investigation performed at Normandy Dam. Kevin Hon currently works for S&ME and has over 15 years of experience in shallow subsurface geophysics after earning his BS in Geology at Wright State University and his MS in Geology at New Mexico State University. Mr. Hon has spent the majority of his career in geotechnical consulting with a particular emphasis on engineering and environmental applications, however, four of those years were actually working for a manufacturer of geophysical systems. He currently serves as the geophysical group leader and technical lead for geophysical applications within the company.